Under pressure, the Obama administration withdrew rules barring young laborers from dangerous work—a decision with grave consequences for several families. This article was reported in partnership with the Investigative Fund of the Nation Institute. Research assistance: Darren Ankrom, Abbie Nehring. The truck Michael wanted was a blue 2002 Dodge Ram pickup with a Cummins diesel engine, the kind you see on rural roads with custom alterations like giant wheels or chromed exhaust pipes curving up from the sides of the cab. Michael’s mind was so fixed on this truck that he’d begun to build his life dreams around it, setting his sights on a vocational program in diesel mechanics. By last summer, Michael had saved up $7,000 from his modest farm wages, but he didn’t live to get his Dodge Ram. He went out the afternoon of July 1 with a friend, 17-year-old Matt McGlasson, to earn just a little more, moving hay bales for a horse farmer who is a cousin of his grandfather’s. 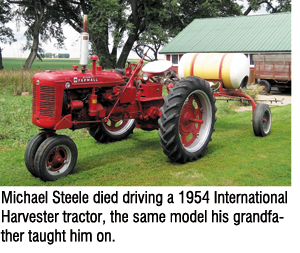 Michael climbed high up into the driver’s seat on a 1954 International Harvester tractor, the same model his grandfather had taught him on—a tractor built before seat belts came along. It had a long flatbed trailer, ten to fifteen feet, hitched to its rear for carrying hay bales. Michael had fallen to the left side, onto the roadway. McGlasson reacted fast, clambering along the trailer to the tractor’s gears to stop it. But the tractor continued, driverless, for a crucial moment, long enough for the left wheels and axle of the flatbed to crush Michael’s chest. He died at the scene. He was just 15. People think of child labor as being a thing of the past in the United States, and to work most jobs kids do have to be at least 16. But from the start, the Fair Labor Standards Act, enacted in 1938, treated farmwork differently. In agriculture, kids as young as 12 can work legally. Provisions governing dangerous work are different in agriculture, too. The Labor Department has a list of “hazardous occupations” that kids can’t do until they turn 18; in agriculture, they can do them at 16, even though federal officials have found that farmworker youth are at “high risk” for fatal injuries. And that hazards list hasn’t been updated since 1970. Last year, that was about to change. In late 2011, the Labor Department, based on research by the National Institute for Occupational Safety and Health (NIOSH), had proposed an updated list of hazardous occupations in agriculture that would be off limits to kids under 16. These included working near manure pits or inside grain silos (the latter had trapped at least fifty-one workers in 2010, more than half of whom died), using power machinery, working outdoors in dangerously hot weather, climbing tall ladders, working with certain livestock, harvesting tobacco, and driving large farm vehicles or trucks on certain roads, as Michael had been doing. “It’s just like in a McDonald’s,” says Zama Coursen-Neff, executive director of the children’s rights initiative at Human Rights Watch. “We let 14- and 15-year-olds run the cash register, but we don’t let them run the fryer.” But after a storm of protest from the Farm Bureau and other agricultural lobbies [see Gabriel Thompson’s article in this issue], the Labor Department withdrew the proposed rules—which had been years in the making—in April 2012. The cost of that reversal may never be officially tallied. But after carefully piecing together available data, I discovered that, along with Michael, at least twelve other young farmworkers under the age of 16 have died since those protections were scuttled a year and a half ago. At least four of them died doing the hazardous tasks those rules would have prohibited them from performing. My attempt to determine how many farmworker kids have been injured or killed since April 2012 met with many roadblocks. One important study, the Labor Department’s Census of Fatal Occupational Injuries (CFOI), released in August and still preliminary, recorded nineteen deaths among workers under 16 last year, up from ten the year before. But it doesn’t yet specify which of these deaths happened in agriculture. Another study, the Survey of Occupational Injuries and Illness (SOII), found a rate of 5.5 injuries and illnesses per 100 workers reported in the agricultural sector in 2011 and 2012—up from a rate of 4.8 per 100 workers in 2010—but it did not provide a tally of injuries to workers under 16. Agriculture has among the highest injury and death rates of all industries. 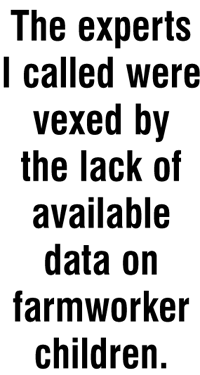 The Bureau of Labor Statistics, which produced both studies, denied a request for case files, arguing that providing them would jeopardize the privacy of employers. (An appeal has been filed with the solicitor of labor.) The federal Occupational Safety and Health Administration, which investigates workplace accidents, hasn’t compiled data for 2012, and dozens of Freedom of Information Act requests filed with regional and state OSHA offices and workers’ compensation boards yielded injury data from only three states. And there are limits on OSHA’s reach in any case. In Iowa, where the agency does cover agricultural employers, OSHA performed just thirty-one inspections on 92,300 farms in 2011. In other heavily agricultural states, like North Carolina, oversight is conducted instead by an agricultural safety council dominated by farmers’ or growers’ associations. North Carolina’s Department of Labor responded to a FOIA request regarding injuries, illnesses and deaths among farmworkers ages 12 to 16 since April 2012 by saying it had “no records or documents” for this age group, adding that employers are required to report only accidents in which an employee dies or three or more are hospitalized. So any incident that does not meet these criteria (such as a single worker being hurt) is not reported. From left: Bill, Dena and Nicole Steele. 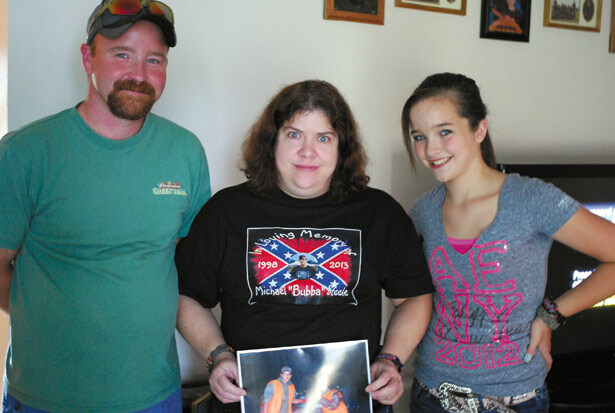 Dena holds a photo of her son and daughter. In the end, I found thirty-nine cases of injury or death over the last year and a half involving 12- to 15-year-olds working in agriculture. About a third—eleven in all—worked on their parents’ property and would not have been protected under the proposed rules, which contained an exemption for kids working on a family farm. But at least twelve kids under 16 were injured and four died doing tasks that would have been prohibited under the rules. An important contribution to the list came from California’s workers’ compensation board, which sent over brief, anonymous summaries of sixteen relevant injury claims. But the cases I gathered don’t reflect the other states that advocates say are likely to have the highest number of young farmworkers: Texas, Michigan, Iowa, North Carolina and Washington State. The cases I did find included 15-year-old Curvin Kropf, an Amish boy from Deer Grove, Illinois, who was killed in July 2012. According to the sheriff’s report, Kropf died after he leaned from his seat atop a tall, tractor-like vehicle called a High-Boy to pull the tassels off a stalk of corn, fell and was crushed under the vehicle’s wheel. According to local press reports, OSHA officials arrived at the scene but left because there were fewer than ten workers on the farm, which meant they lacked jurisdiction. (The same was true of the farm where Michael Steele was working last July.) I also learned about Cleason Nolt, 14, a member of a Mennonite community in Peach Bottom, Pennsylvania, who died along with his father and older brother: all three drowned in a manure pit while working as contractors in May 2012. 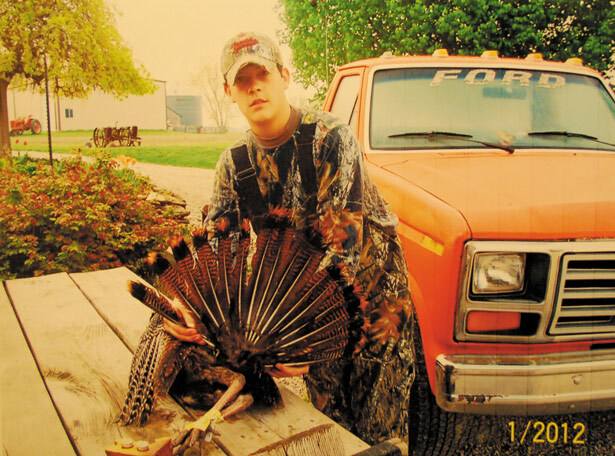 Another preventable death was that of 18-year-old Kyle Beck of Wauseon, Ohio, who was killed when he fell beneath a wagon full of grain that was being pulled by a 15-year-old driving a tractor, which would not have been allowed under the proposed rules. In 2011, his mother moved in with her partner Miguel, an immigrant from Michoacan, who has worked for the past seven years as a hired hand at a cattle ranch in Idaho. The reserved, hard-working Miguel and the cheerful, charismatic Enrique got along, and the three shared a one-bedroom house on the ranch for which, Miguel said, the owner did not charge rent. In their little home, Enrique occupied a place of honor: he had the sole bedroom to himself, with a double bed on which he would stretch out to do his homework. His mother and stepfather slept on two foam-upholstered benches in the living room. The ranch where the family lives is nestled deep in a lush Idaho valley surrounded by mountains that appear purple, until the clouds part to let through ladders of sunlight. 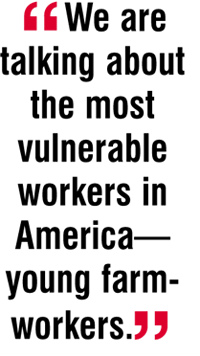 The soil is black, rich in minerals from nearby springs feeding the Bear and Portneuf rivers. The potatoes that grow in this region—the ones Enrique irrigated—are legendarily delicious. One Saturday in April, Enrique evidently had trouble starting up one of the farm’s pickups. What happened next is something of a mystery. The sheriff’s report puts three pickup trucks in the yard: a Dodge, a Chevy with a heavy steel flatbed—“We’ll call it a one-ton flatbed,” Sheriff Anderson says—and a Ford. A farm dog was inside the cab of one of the trucks. Enrique somehow got smashed between the one-ton Chevy and the side of the Dodge. He died there, pinned upright. Miguel, unable to reach him on his cellphone, went to the yard and found Enrique, already dead. The officer who reported to the scene wrote in his statement: “Appears that the chev pickup would not start so [Enrique] hooked both vehicles together and was trying to pull the chev pickup back some how [Enrique] ended up pinned between the two vehicles, it is unknown if the dog knocked the transmission into neutral in the chev.” He then describes walking over to Enrique, whose mother was holding up his body. “I could tell…that he had been dead for some time,” he wrote. OSHA opened an investigation at the ranch and last month published its preliminary findings, which cite eight violations of safety rules, six of them “serious,” for a total of $8,500 in fines. OSHA’s findings don’t mention that 14-year-old Enrique was handling the massive trucks alone; because the updates to the hazardous occupations rules were withdrawn, such work remains legal for kids like him. But there is support for his family’s claim that Enrique was employed on the farm in the smallest of the fines: $500 for the failure to record a fatality as a work-related death. 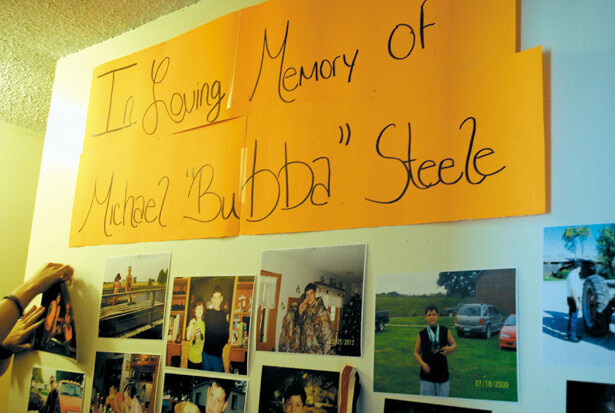 Michael Steele’s sister Nicole has a wall of photos commemorating her brother. Michael Steele and Enrique Lopez were both outgoing and popular, and their deaths hit their communities hard. Enrique’s high school organized a memorial service for him and devoted space in the yearbook to his memory. Students had rubber bracelets imprinted with his name. Traces of grief for Michael appear online: the Facebook memorial page that his mother set up for him has 866 “likes.” Both boys were big for their age, responsible, and had their eyes set on the future. Perhaps the adults in their lives—parents and employers alike—were convinced that they could do many of the things that men do. Indeed, they were highly capable kids. But they weren’t men. The lack of reliable information on kids like Michael and Enrique became even more glaring when I began looking for nonfatal injuries, which usually aren’t covered in the press. The local newspaper item on Andy Mink, 15, who was hospitalized after being hit by a commercial truck as he drove a tractor for his summer job out on a Missouri road last July, was a rarity. California’s list of sixteen workers’ compensation incidents involving kids under 16 included lacerations, sprains and even anaphylactic shock. I asked Barbara Lee, director of the National Children’s Center for Rural and Agricultural Health and Safety, based at Wisconsin’s Marshfield Clinic, why there was no national database of injuries to young farmworkers. “Because there’s no federal agency charged with doing this,” she replies. “We have different federal agencies collecting different types of data. But this particular situation falls through the cracks.” She said that every three to four years, the center receives estimates from NIOSH’s survey of injuries that occur on farms and then does its best to extrapolate the risks to children. But those NIOSH surveys produce only estimates, based on voluntary reporting by farmers. “They only ask about direct hires,” says Coursen-Neff of Human Rights Watch. “You have a whole category of children who work through contractors just like adults do. But you also have a whole other category of children who may or may not be legal to work—some are working who are underage on large farms, and some who might be legal age to work but who are not working on the books, who are out there with their parents.” Enrique was one of these, working off the books at his stepdad’s side. Defying stereotypes, the Model Alliance gets serious about organizing—and writes its own law to protect the most vulnerable models: children and young teens. See Elizabeth Cline, “Fashion Models Are Workers, Too” (Sept. 30). Mariya StraussMariya Strauss is a Baltimore-based writer.